A sprained ankle is one of the most common injuries in all of sports, affecting amateur and pro athletes alike. The injury involves stretching or tearing the ligaments around the ankle. It can be a minor nuisance to the athlete, affecting activity for a couple of days, or it can be a source of long-term disability for weeks, or even months. Ankle sprains usually occur with a twisting or turning force to the ankle. Most commonly the athlete lands on the outside of the foot, causing injury to the lateral, or outside, ankle ligaments. Depending on the direction of the force on the ankle, the athlete can tear the medial, or inside, ankle ligaments. It is also possible to injure the ligaments between the tibia and fibula, causing a syndesmosis ankle sprain, better known as a “high” ankle sprain. Prevent possible injuries with lace up braces. The athlete who sprains his or her ankle usually remembers the traumatic event. He might describe feeling or hearing a pop. Frequently it is very difficult to bear weight initially, and the ankle will be noticeably swollen. Sometimes a tremendous amount of bruising will be seen both around the ankle but also in the foot and toes. Usually the pain is worst below the bones on the inside and outside of the ankle, along the course of the ankle ligaments, rather than on the bones themselves. The standard protocol for acute sports injuries applies to ankle sprains as well. Rest, or avoiding any activity that causes further pain and swelling, is mandatory. Ice to the injured part of the ankle for twenty minutes many times a day will help to decrease swelling. Compression with an ACE bandage can also decrease swelling. Elevating the injured lower extremity above the level of the heart is also essentially to try to minimize the swelling, and consequently, the pain. If the symptoms improve quickly, further workup or treatment might not be necessary. If the athlete is having sharp pain on the bone, tremendous difficulty with any weight bearing, or simply is not improving quickly, evaluation by a sports medicine physician or emergency physician might be warranted. Often x-rays will be requested to rule out an ankle fracture. 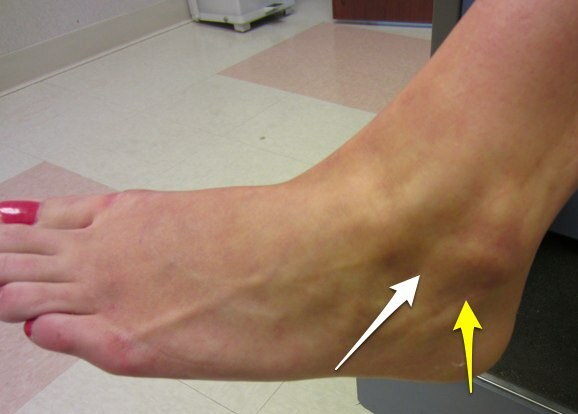 Lateral ankle sprains often injure the ATFL (white arrow) or the CFL (yellow arrow). Less severe ankle sprains often resolve spontaneously without formal diagnosis or treatment. The athlete often can perform exercises to accelerate recovery and shorten the time it takes to return to sports on his own. There are a variety of exercises that are beneficial, but the goals are to improve motion, balance, and strength of the ankle. Often working with a sports physical therapist once to learn a home exercise program or several times a week can bring about quicker resolution of symptoms and hasten return to sports quicker than the athlete trying to do it on his own. Expected duration of time out of sports differs with the severity of the injury as well as the speed of recovery. In general, when pain and swelling are gone, especially after activity, and motion, strength, and balance have returned to normal, then sports activity is felt to be safe. The use of braces or taping is somewhat controversial. Initially, a brace may provide support to allow comfortable walking and jogging prior to sports activity. The use of braces or tape on a daily basis is often attempted for recurrent ankle sprains to prevent further injuries. Consultation with a sports medicine physician can help to determine which, if any, braces or taping might be protective. Exercise programs to strengthen the ankle performed throughout the sport season are also thought to be helpful to prevent further ankle sprains. 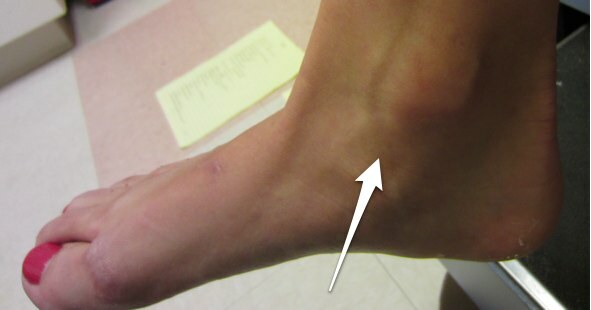 Medial ankle sprains can involve the deltoid ligament (white arrow) on the inside of the ankle.